Spearwood 7 Day Pharmacy can help give you peace of mind by packaging your medicines in a weekly pack so that you take your tablets and capsules at the right time and in the right combination. Webster-pak is a safe and simple pack to use. 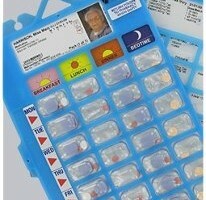 The tablets and capsules are sealed in a blister pack so that they are placed in the clear blister well for the particular day and time of day. The pack lists all the contents of the pack and when it comes time to take your medication the patient or carer simply pushes out the contents of the blister packaging through the foil backing for the correct time and day. You know you are up to date as you can see exactly where you are up to by the pushed out blisters. Spearwood 7 Day Pharmacy dispenses the prescriptions only when needed to pack a new Webster-pak and maintains a profile of the doctors orders for medications to be taken and when they are to be taken. We can even add vitamin products you want to remember to take each day. The packs are securely sealed so there is no chance of mixing things up. The patient’s medications that are awaiting packaging are kept safe and secure in a separate box and only used for the named patient. Webster packaging is provided at a cost of $5.00 per pack which is ususally $5.00 per week. Veteran Gold card holders who’s doctor assesses them as eligible for a veterans dose administration aid prescription, receive webster-paks free of charge.